Every month here at Plaid, I teach a corporate sponsored Lunch and Learn event. 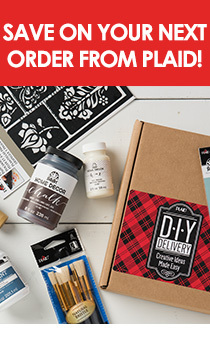 And every month our craft project features a new, innovative and exciting craft product line. This month's Lunch n Learn event was not a disappointment by any means, within moments of posting our project, our sign up sheet was almost full! Featuring our Bucilla Handmade Charlotte Wood Stitchable Seasonal Ornament set it was not a surprise! Everyone LOVES Christmas in July, right? So I thought why not celebrate the upcoming holiday season and get everyone started making their own special holiday ornaments to present to loved ones as gifts, to use as gift tags, on holiday greeting cards or to hang on their own tree! Once you open the package you will find a set of eight different wood cutout ornaments featuring a Santa, snowman, tree, angel, gingerbread man, stocking, owl and an ornament! You are also given an instruction sheet with enlarged, easy-to-follow diagrams, embroidery floss, and a cross stitch needle. The first thing you will want to do is separate all the floss into color groups. Easily done ... Then select the ornament you want to start with. I chose the Santa to begin my grouping. Santa used mostly red and white floss with just a touch of black. Gather your supplies and pattern in front of you. I started with the red.... first take one piece of red floss ... you will notice that there are six strands of floss all twisted together in one hank. When stitching any needlework project, it is always best to separate the strands and then rejoin them before beginning your first stitch. This will help make your floss "fluffy" and give your stitches more height. To separate the strands, grab onto one strand and pull it away from the rest. Continue until you have three separate strands. Join them back together and fold them in half matching the ends. Thread your needle next, threading all six ends through the eye of the needle at one time. An easy way to do this is to press all six ends together between your thumb and forefinger in one hand and with the other hand, pass the eye of the needle between your pressed fingers catching all strands of floss through the needle eye. You can also cut a small strip of paper the width of the needle eye, sandwich all six strands and fold the paper in half. thread the paper through the needle, VOILA, you have threaded your needle with the assistance of the folded paper! Notice the loop on the underneath side? Take your needle and pass it through the loop, then pull the rest of the strands of embroidery floss tight. Voila! You have captured your floss without knotting it and now ready to stitch. NOTE: Always refer to a pattern diagram when working with a kit. The diagram will show you specifically where the stitches are to be placed! Continue stitching until you run out of floss. Rather than creating a knot, I like to run a few stitches through the backside of previous stitches then trim. This technique makes for a prettier finished back. Here's a handy tip ... I found that some of the wood burned, laser cut holes "grew small" after I had stitched in that same hole a few times each with six strands of embroidery floss. So I grabbed my handy jewelry flat nose pliers and used them to help assist the needle through the hole. OK ... so now all the red areas have been stitched. I have completed the hat and outlining the hat with back stitches as well as created the small "x" stitches throughout the beard. Fill your needle with white in the same manner as you started the red floss. I stitched the mustache area first then stitched all the outline stitches around the "stache", the curls in his beard, and around the hat including a few "x" stitches. The last part is to add two small French knots to the eyes. Voila! You have stitched the entire Santa ornament! however, I decided to gather up a small piece of red felt and some SoBo white craft glue to finish it off. I added glue to the back of the ornament then pressed the ornament over the red felt keeping it flat until it was dry. Once dry, I used a pair of scissors to trim around the edges and added a section of ribbon to the hole. My Bucilla Handmade Charlotte Wood Stitchable Ornament is now ready to hang! I often date my handmade ornaments, the backside is a perfect place for that! I hope you enjoy creating handmade ornaments this year too. July is the perfect month to begin! Try these Handmade Charlotte Wood Stitchable ornaments, you will love em!